Through this book, I would like to suggest the reason why such diseases as rhinitis and sinusitis have not been cured well, and provide various curing methods by focusing on various contents related to the nose. There is a way of getting the right effect for your nose without having to take surgery. Even if you still need expert's help, there are some medical treatments which you can apply by yourself. By curing rhinitis and sinusitis, you can have better results for such representative symptoms as headache, xerophthalmia (dry eye syndrome), insomnia, tympanitis, tinnitus, Meniere's syndrome, snoring, sleep apnea, and occipital headache. I hope that even experts could get some help from this book. Just like those who diagnose diseases through such things as one' iris, stomach or large intestine, I am now able to figure out various symptoms through the nose. I would like to introduce this way to you. However, such a way is not mine. 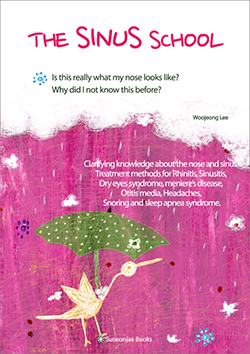 I would have never figured this method of solving problems related to rhinitis and sinusitis without the help given by Director Tae-Hun Lee from Muryenco Oriental Clinic. Because of his help, I am now able to see various things through the nose. I would like to thank him for all his support and time. Are you ready to take a trip in the nose now?